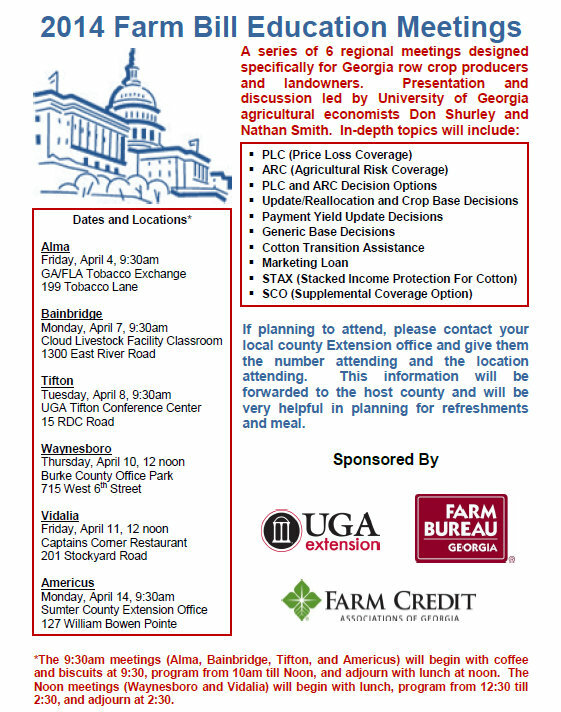 We will have an Extension Farm Bill Meeting in Bainbridge on Monday, April 7th. Please call the Decatur County Extension office at 229-248-3033 to let them know if you are coming so they can plan for the meal. There will be coffee and Biscuits at 9:30 and lunch at the conclusion of the session. See the flyer below for more information. There will be other regional meetings as well as outlined below. 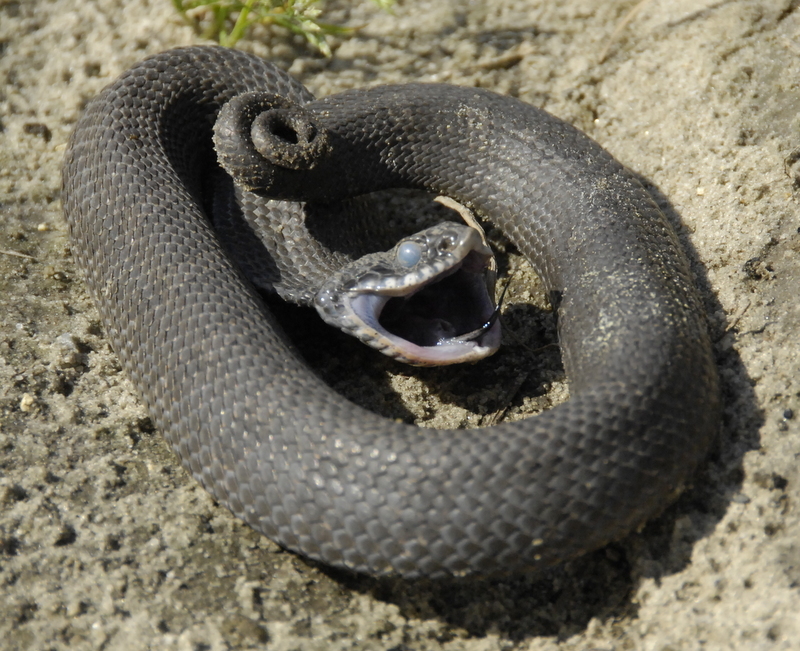 Last week I had a snake photo and it was a Hognose snake aka Spreading Adder. They are pretty common here and cause no real harm to people. 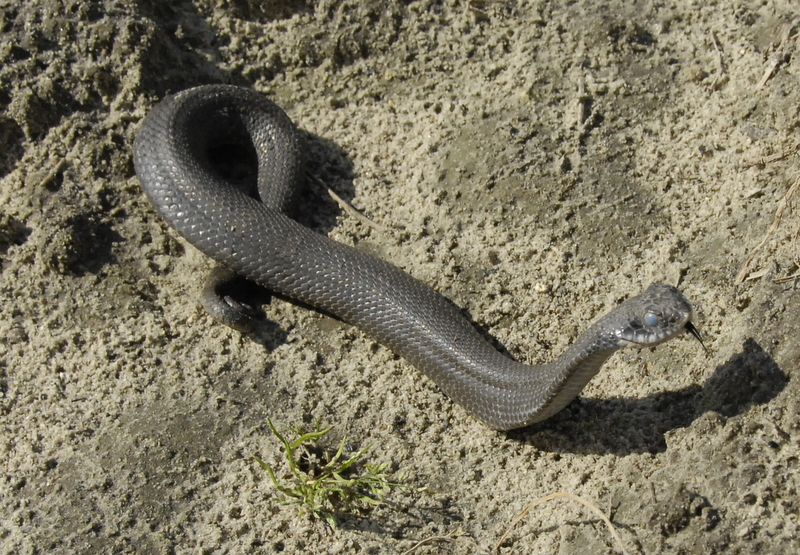 They like to eat frogs and toads, and do kind of look like a cobra when disturbed and hiss and flatten their necks. They will also play dead and flip over comically. This one had cloudy eyes apparently due to being close to shedding the old skin. I had many correct answers and you can look in the comments question under the post last week to see some good information. Here’s this week’s question. What is this? 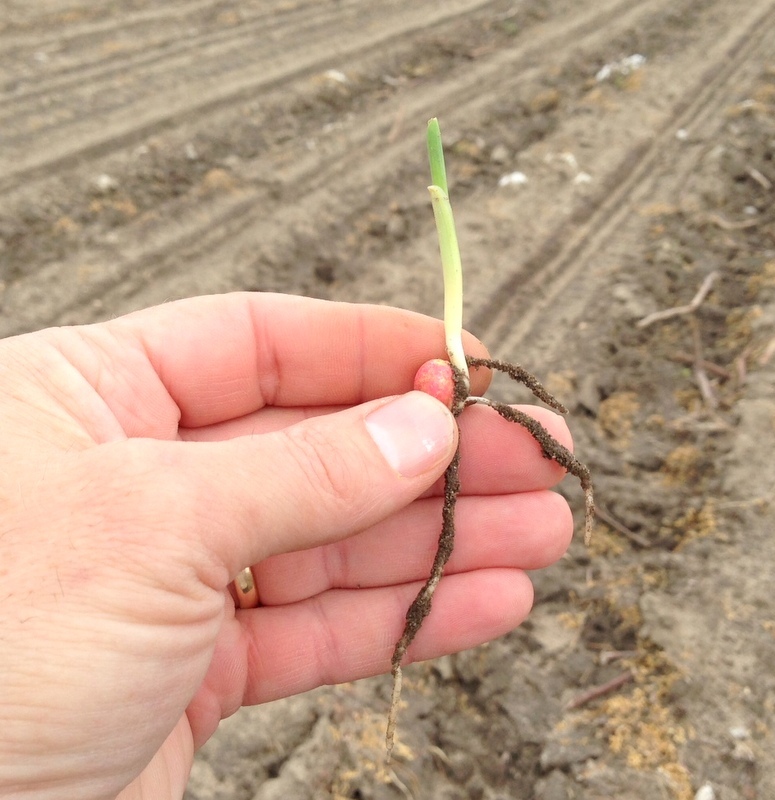 We now have some field corn that has celebrated a month of age today. I took some photos of it yesterday. 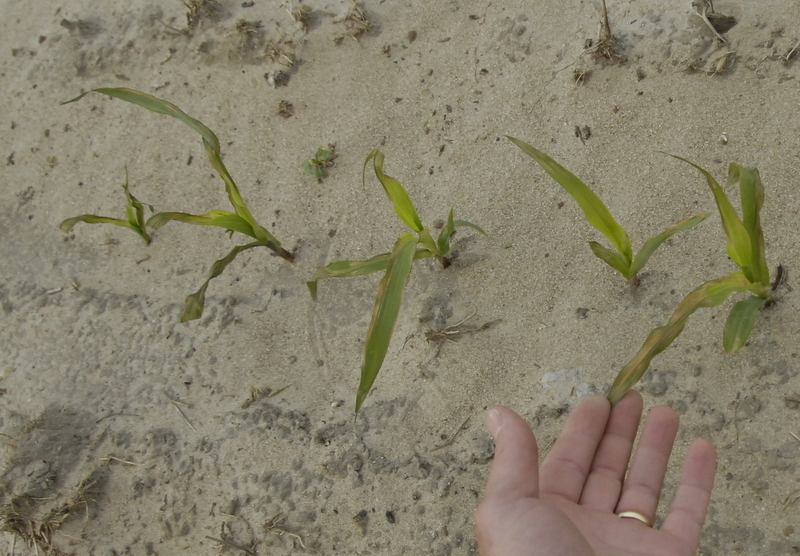 It is growing with some challenges due to cool temperatures causing yellowing and slower growth and sand blasting. 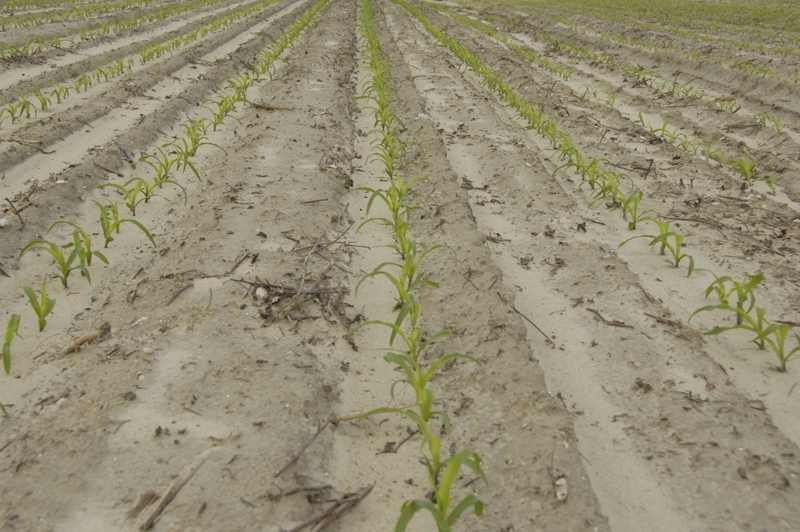 Stands look pretty good so far, but we are having to deal with crusting soils in between the rains. 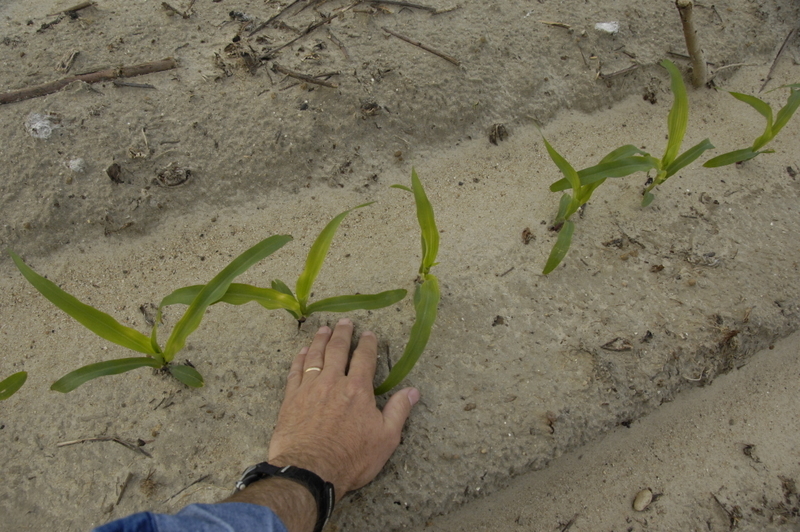 We need to wet the crust in most cases to soften it to get all our plants up evenly. 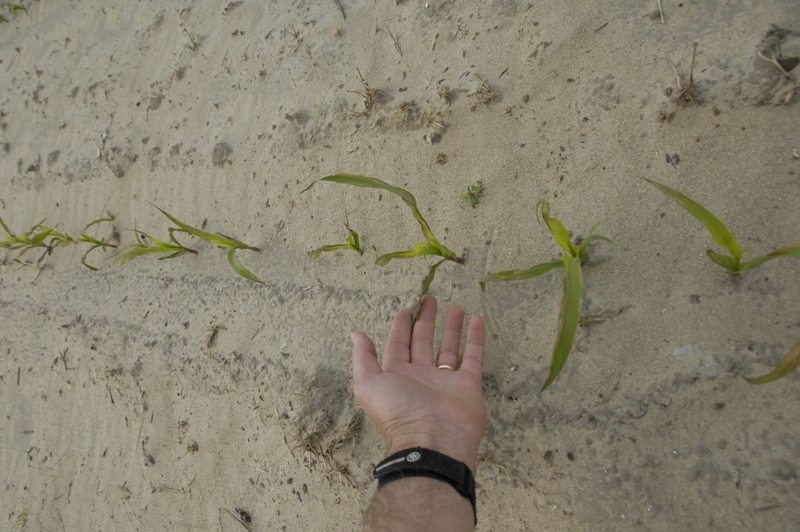 We are getting some sub surface unfurling and loss of plants due to the hard crust. Here’s some sandblasting that occurred with the high winds this week. 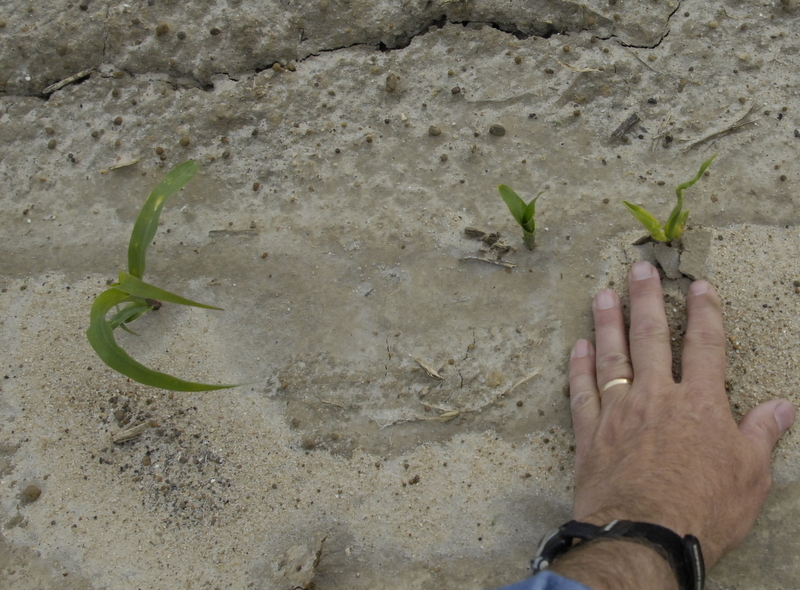 Soil crusting has been a problem, hurting us in some cases. 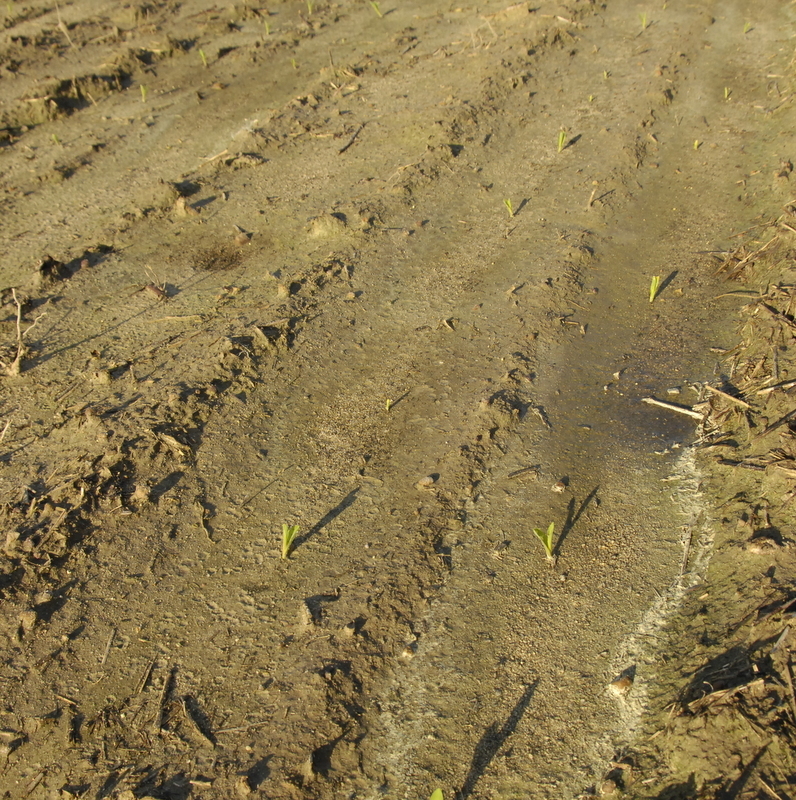 A light irrigation does a lot of good for this problem. I gave a talk this week to our Young Farmers group concerning water and weather info and outlook. I have my slide show on youtube that you can watch below. I have links to most of the sites mentioned on my blog, that’s what the first few slides are showing. The Floridan Aquifer here is in good shape. 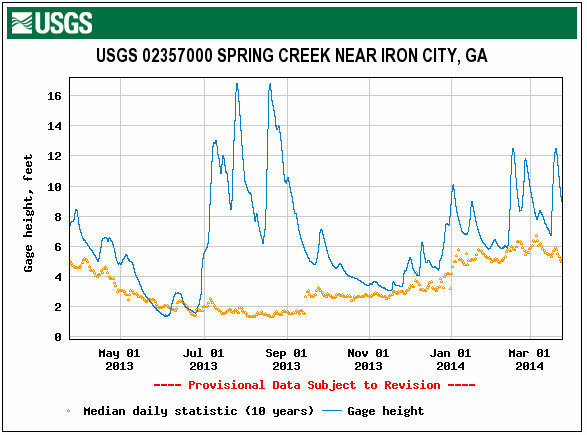 Here’s water levels in the test well above Brinson Georgia in Miller county. This shows from this week and a year back in time. The blue line is our levels, The orange triangles are the long term average. So since July 2013 we are in good shape. 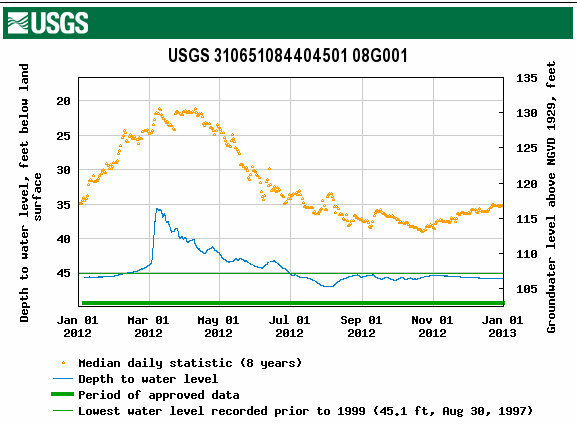 Here’s what 2012 looked like with our aquifer levels, we were below average for sure. 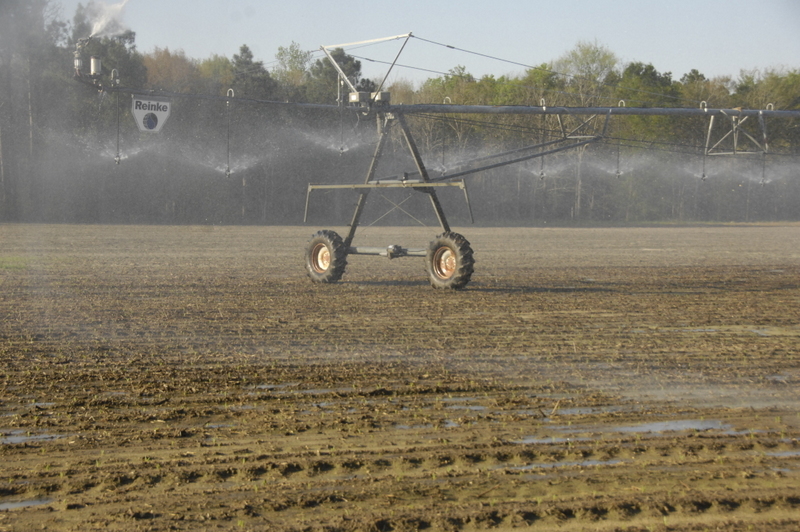 We see that so far in 2014 we are having normal rainfall and it looks like we are forecast for this to continue. 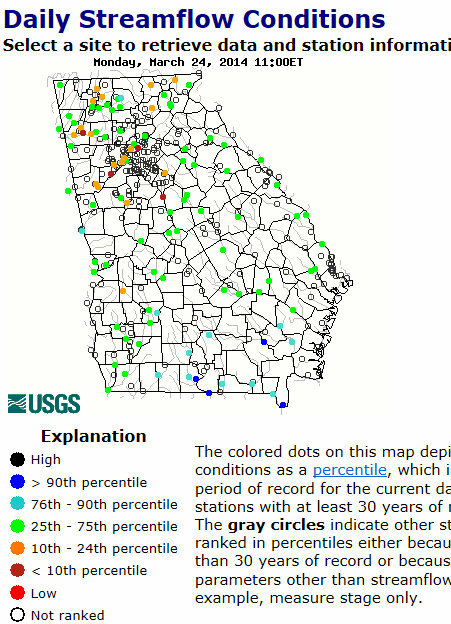 You see that surface water in Georgia is in pretty good shape right now. 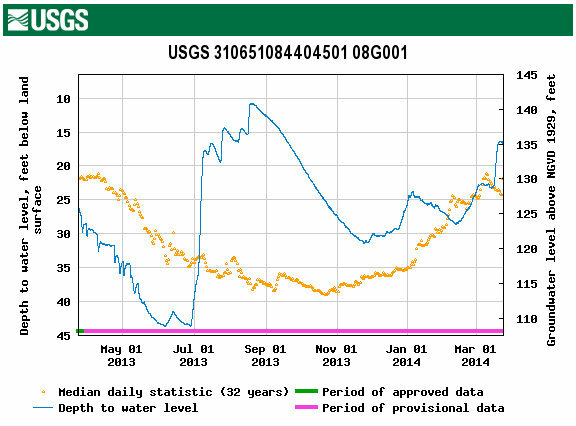 Here’s our own Spring Creek levels for the past year. 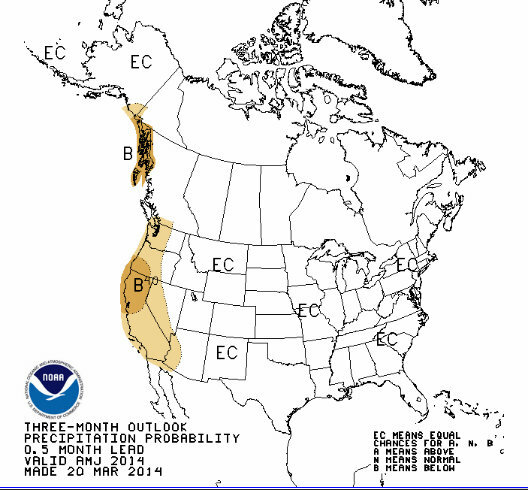 Our long term outlook is for normal rain, whatever normal is? What is normal? 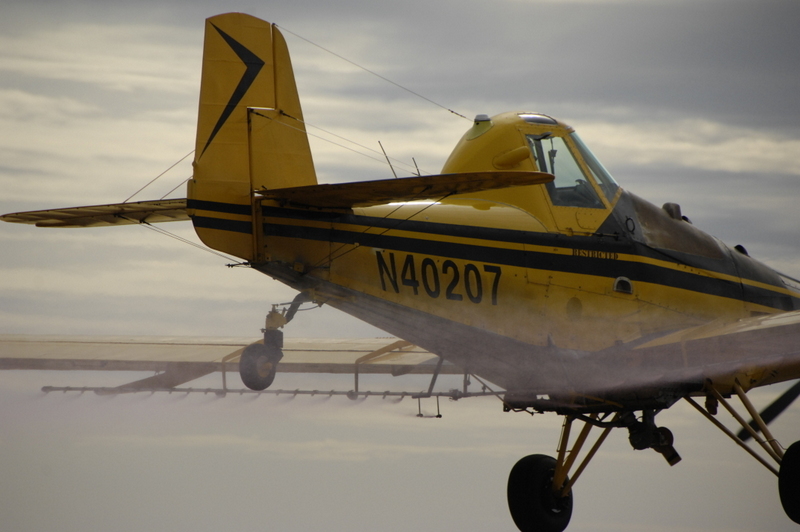 On Thursday, UGA Extension had an educational event for aerial applicators at the Donalsonville airport and 8 area pilots participated in the training. 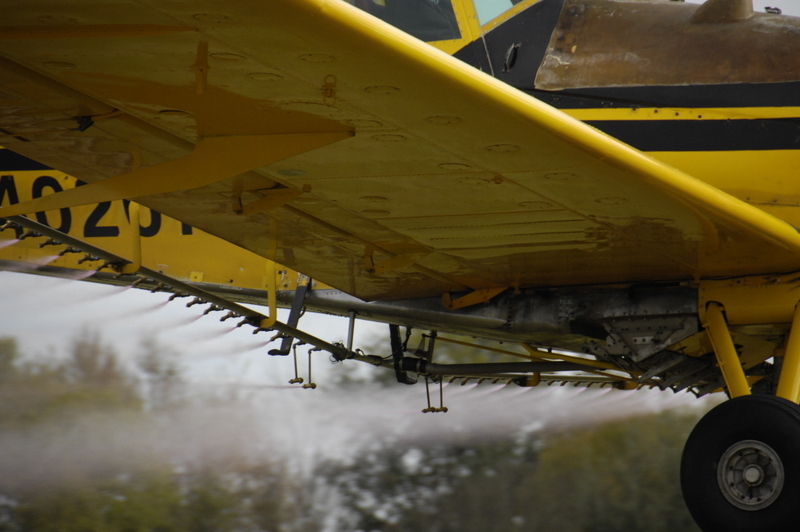 There was classroom training and also they could fly their planes over a test area to analyze their spray pattern , their droplet sizes and gallons applied. Dr. Glen Raines, UGA Extension Engineer, was here to do the analysis and help get everything just right. They put water and blue dye in their tanks and flew over a cotton string and water sensitive strips. Then Dr. Raines analyzed the data to give recommendations. Thanks to Patch Price, Georgia’s senior ( I won’t say oldest) active Ag Pilot, and Seminole Aviation for hosting the event and providing lunch for the group. 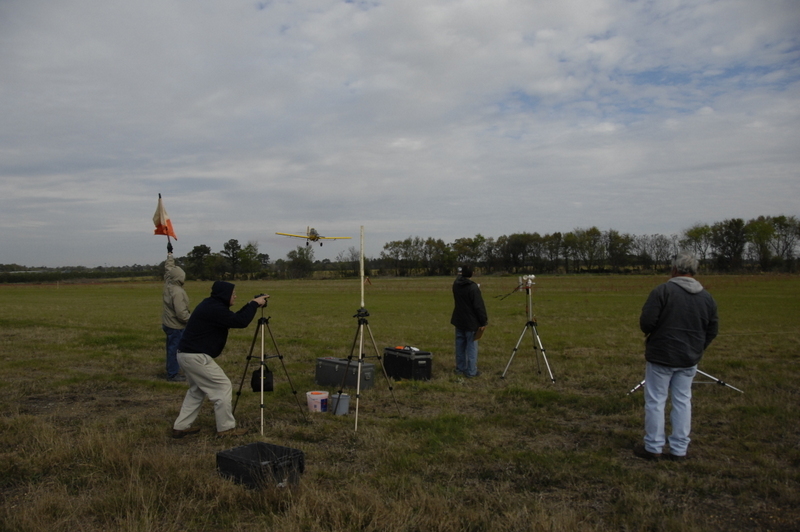 I was often checking air speed as they flew over the test area at 12 to 20 feet high. 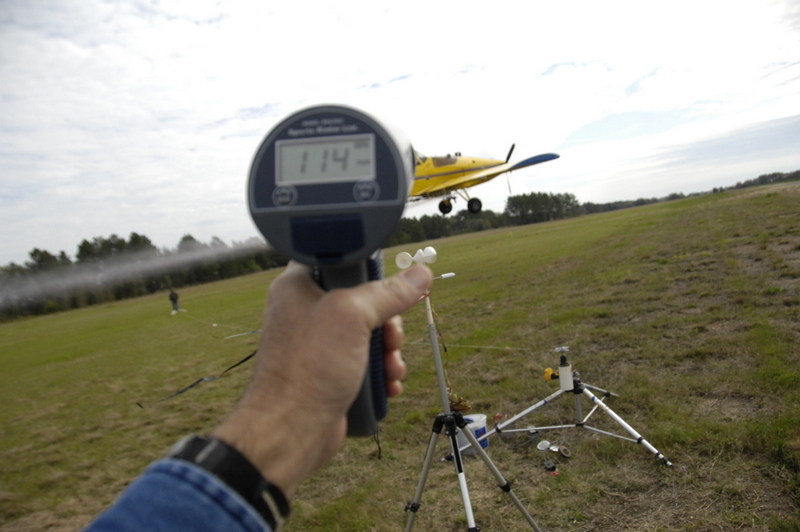 The speeds ranged from 85 to 139 miles per hour. 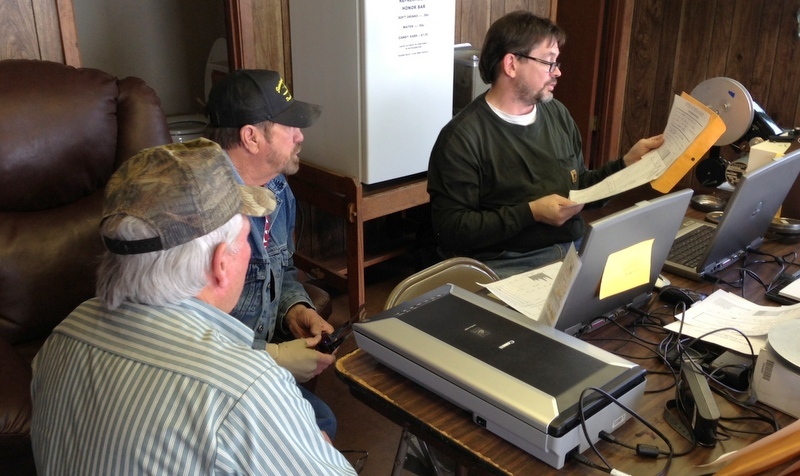 Here Dr. Raines is showing the results of the string test with Pilots Patch Price and Wayne Womble. 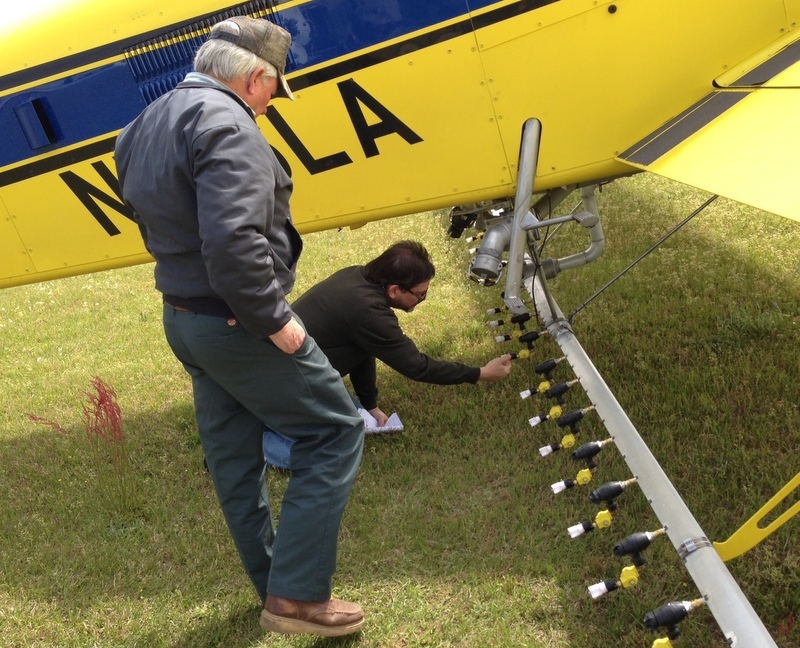 Dr. Raines and Pilot Wayne Womble discuss his new spray nozzle setup and how to improve it. Don’t miss the Peanut proud celebration tomorrow in Blakely Georgia. Photo from Brad Haire’s report. 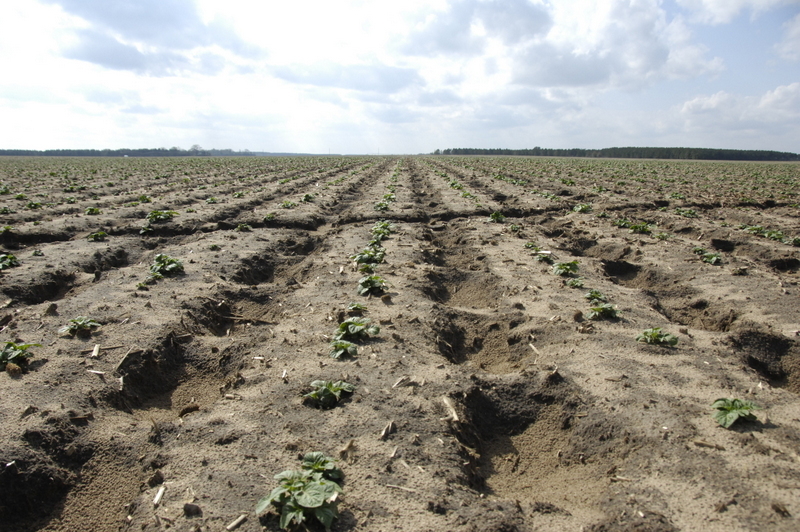 We have some large fields of Irish potatoes coming up and growing well. Most of the ones planted here will go to be crispy potato chips. They were a little slow due to the cold weather but are growing strong now. 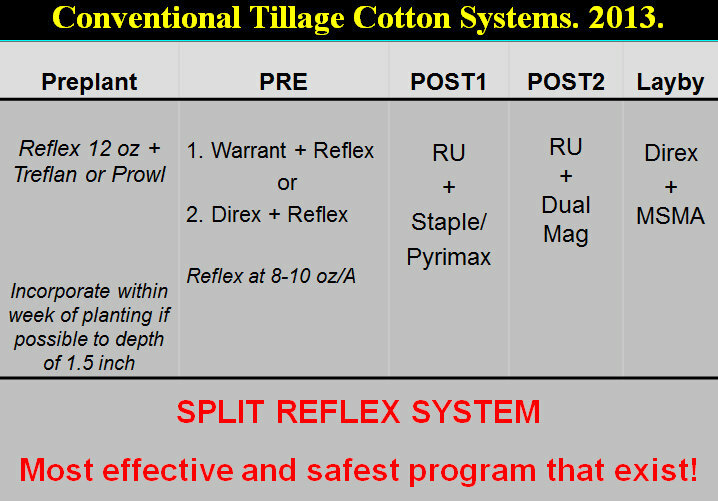 If you plan to plant dryland cotton and you want to get some control even if it doesn’t rain for a while to activate it , this may be for you. 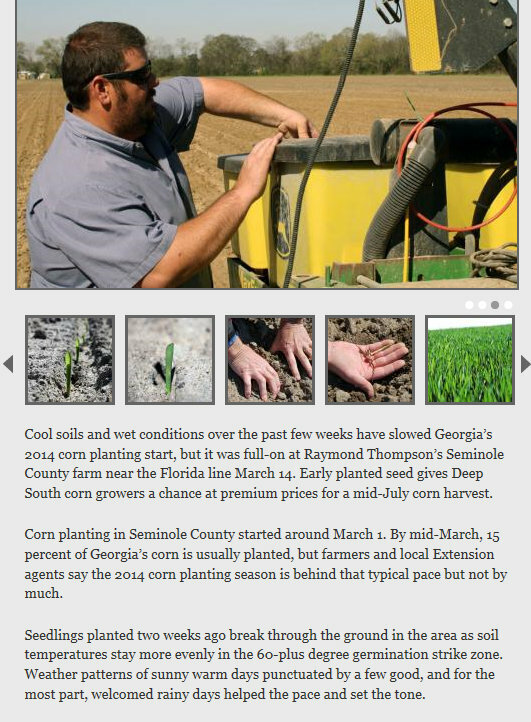 Dr. Culpepper, UGA Extension Weed Scientist, shared this at recent production meetings. 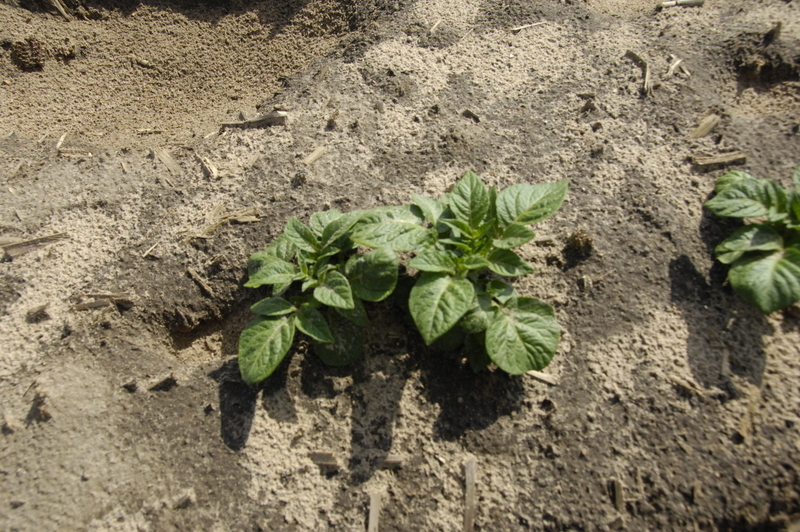 You put out some Reflex and work it into the soil 1 and a half inches deep to help prevent pigweeds without rain activation. 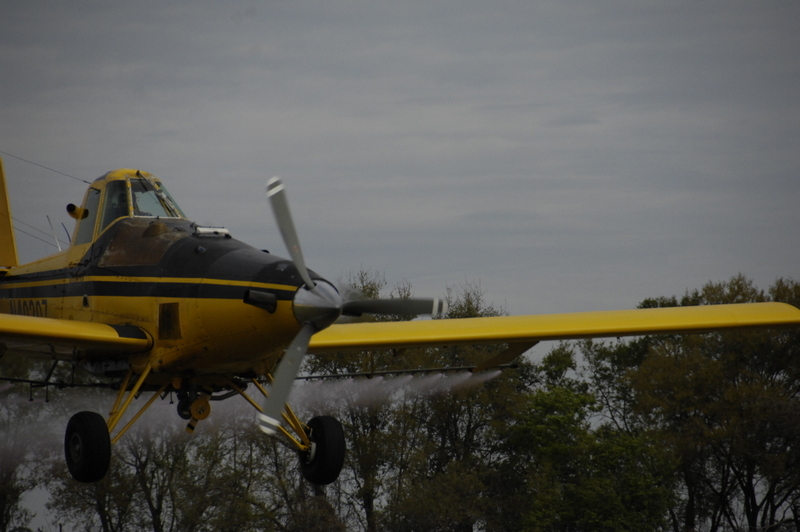 Then you plant and spray some more just after planting with warrant or Direx. Last week I asked about why an area around an irrigation pivot was all dug up. It was wild hogs digging up yellow nutsedge tubers. They love them. 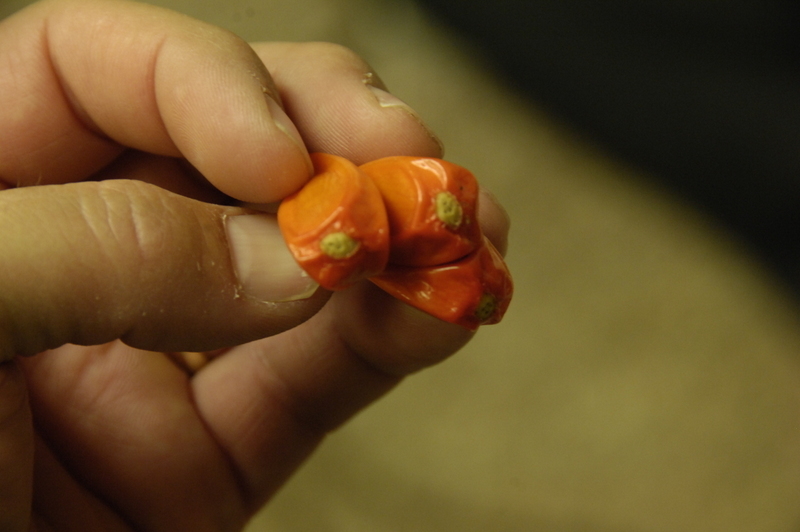 They are sold as Chufas to plant for turkeys. 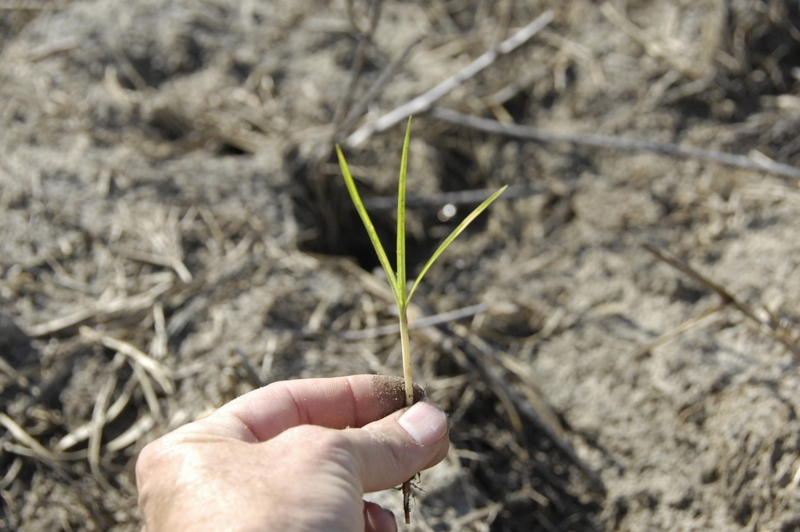 Here’s a photo of some yellow nutsedge coming up in the area. This week’s question follows. What kind of snake is this that we came across at the irrigation pivot mentioned above. Is it a cobra? It was hissing and the neck is flattened? And why do the eyes look like that?